The outline map of Nantucket island, appearing in the upper left hand quadrant, is based upon a map prepared by William Mitchell, a Nantucket local and lifelong friend of Bache. 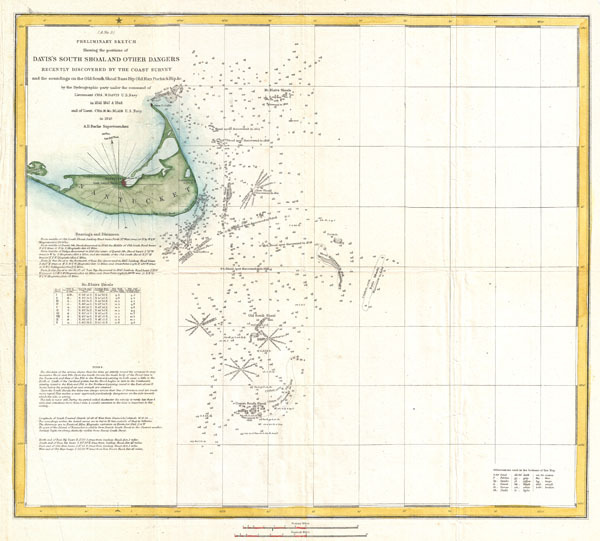 This outline of map of Nantucket would continue to grace the upper left corner of the U.S. Coast Survey 'Davis Shoal' sheets until the late 1850s. Additionally this map contains a wealth of practical information for the mariner from oceanic depths, to harbors and navigation tips on navigating the tidal currents. This map was created under the direction of A. D. Bache, Superintendent of the Survey of the Coast of the United States and one of the most influential American cartographers of the 19th century. The hydrography for this map was accomplished by a party under the command of Cha. H. Davis in 1846-48 and Cha. H. Mc. Blair in 1849. Report of the Superintendant of the United States Coast Survey, Washington, (1849 edition). Very good condition. Minor closed and repaired tear extending from left center into text. Original folds, else clean. Bache, A. D., A report of the superintendent of the Coast Survey... 1852, 1852. Phillips, Philip Lee. A List of Maps of America in the Library of Congress, p.259.